Let's start in the corner, shall we? That would be music. 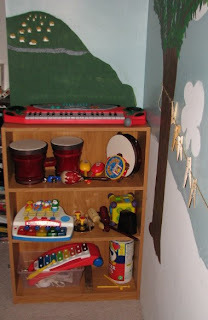 Keyboard, bongos, cluster bells, maracas, tamborines, preschool piano, cymbals, guiro tone blocks, music disco box, cowbell, xylophone with sheet music, jinglebells, train whistle, and oatmeal box with drumsticks. Rat-a-tat-tat. And pretend paraphernalia. Scarves hanging on the left - winter scarves and silk scarves. Hats and arrows at the top. 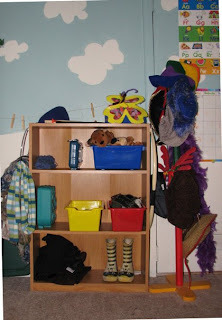 (The bow is hanging on the right side of the shelves.) 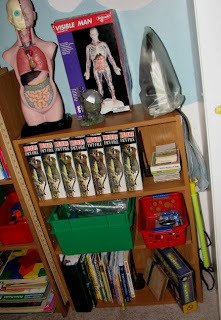 A giant net, a doctor's kit, and puppets. Fancy stuff is next - make-up brushes, sherriff badges, diamonds, fancy beads, mirrors, and jewels. Belts and holsters in the red box. Bottom is a stack of clothes, and bumblebee rainboots. Hats Galore to the right. Oh - and One Purple Boa. Going around the corner - past the door - is the Building Station. 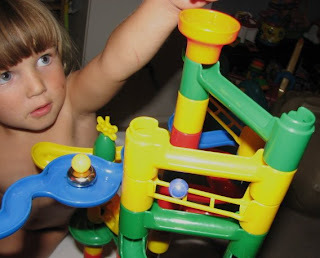 Littlest Legos, Lincoln Logs, Jenga blocks, building wooden blocks and Marble Run chutes on the bottom. Aah - now we come to the pretties. 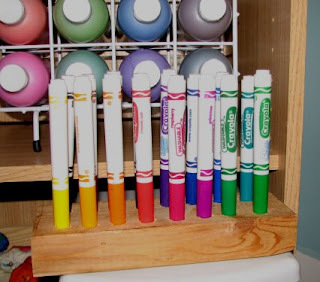 Next shelf is also art- beads (for Madd, but tiny ones, and out of reach) in the yellow tray/box, pens, pencils, tape, glue, glitter, etc in the blue shelves/tray/box thingy, mounted markers, and washable tempera paints. Next up are the containers, with buttons, wooden shapes to be painted (or not), pompoms, and heavy paper shapes. Lots of clay in the wooden tray, pipecleaners, googly eyes, plastic strings, and other such fluff in the white boxes. I made this myself, thank you. Me (to Eric): "D'you know what this is for?" Eric: "To keep them organized?" A smiling/laughing me: "Well, that would be sort of excessive, wouldn't it? (But a fair guess.) "It's for keeping them intact, so the lids don't get lost." Eric: "Ah, good idea! You're so smart!" I can't take the credit, of course. Friend Teri has one, and DS offers them. 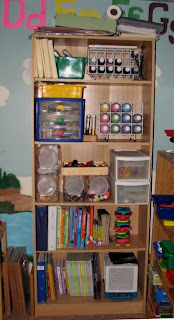 I just didn't want to buy one...Next shelf is reading stuff - with trace-ables, workbooks, and alphabet ideas. Just in case anyone ever wants them. (Bought pre-unschooling - when Trev was three or so.) And a gorgeous wooden alphabet puzzle. 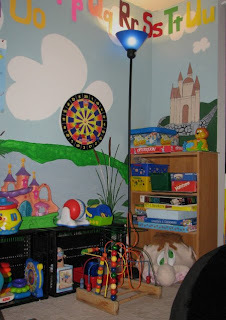 Bottom is the LiteBrite (couldn't fit it in the games section) and About Our World books. Egypt, archeology, pirates, Lincoln, different countries, national geographics (only a few, need to remedy that), etc. Next up is Math. 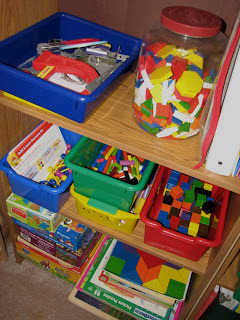 Scale, timer, abacus, peg puzzle games and jacks, magnets with giant bottle of filings :), pattern blocks, and math books. Then geometric shape building blocks, cuisenaires, one inch cube blocks, and dominoes. At the bottom are the puzzles and the tangrams. Meter stick hangs on the side. We have Helga, our rain gauge, our visible man (he needs to be rebuilt - with super-glue this time) and the microscope. 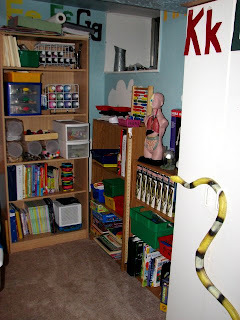 Next shelf holds our WildLife Fact File books, our dinosaur cards, and our animal cards. In the big green box is all of our microscope stuff - petrie dishes, slides, covers (I found them!) prepared slides, bluing, and eosine y, etc. The red box holds magnifying glasses, battery making stuff, prisms, and various sciency sorts of things. On the bottom are books, our plant press, and our physics kit. Bug catcher (one of several) hangs on the side. Madd came down and played, after all. 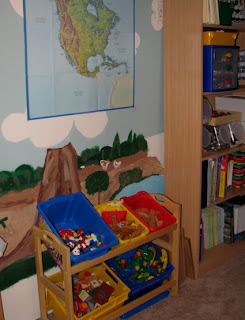 It's a playing sort of room. Wow! So well organized. I'm jealous:) Where did you get your small bookcases? That's definitely something we could use around here. K - you'll be welcome! Shopko (where I get all of my bookcases, except for the one Steph tossed my way) had them on sale from 29.99 to $15. The baskets I picked up - some I had- but two sets of four I picked up at Lakeshore, for 12.95 for the set - minus 20% off. 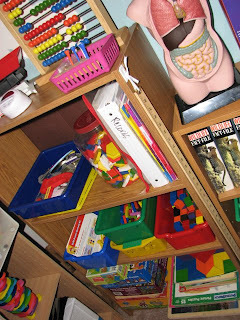 Much prettier and more organized than rubbermaid storage boxes!! What an absolutely amazing room! Your kids are sooo lucky! Love the room! Love it! Very awesome.